I never saw a quince tree till I lived in NS where I fell in love with them. they are so bright and rich in color after the dullness of winter. Yes, they are just wonderful and cheering. And I love the way there are just blossoms and bare branches, without leaves. It reminds me of a Japanese painting — as minimalist and uncluttered as a haiku! 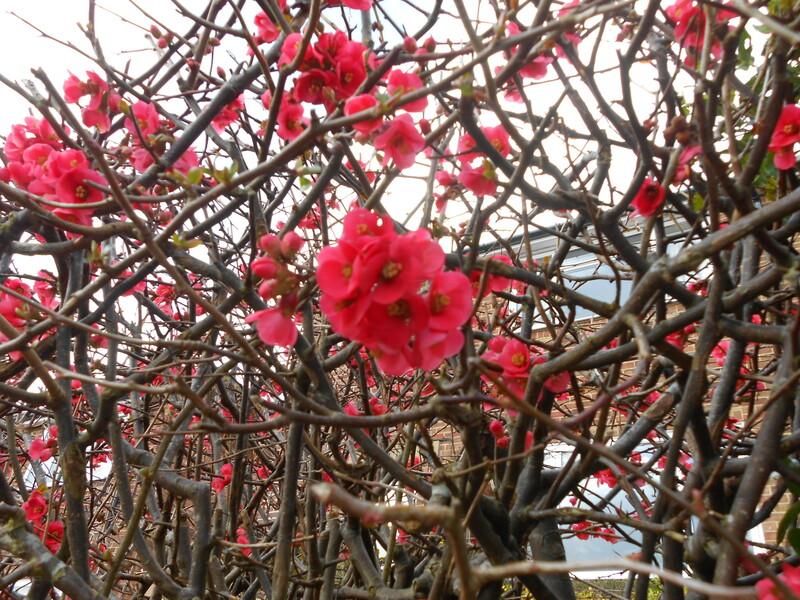 How beautiful – I’ve never seen quince blossom before. The sight of them is a wonderful uplift after the winter gloomies. There are loads of them growing in my locality, where the soil is primarily chalk. The colour is beginning to show here too… Just a few more days until it all comes. We’re often a month ahead from the rest of the country where I live, as it’s a bit of a micro climate. It it to do with the sea? We have a micro climate here and it is to do with the very steep slopes and mountains. Previous Previous post: Wordless Wednesday — Danger, Ravenous Tree on the Rampage!